The Second Age: Garbage is Political? Oh, Boston, Massachusetts. A city where black and white don't really mix and home to a stark racial history. Where the money is old, and apparently the trash cans should be, too. The members of the Back Bay Architectural Commission, a group designed to keep the historic aspects of the neighborhood intact, have been up in arms over a trash can. Not just any old trash can, though, a cleaner, more efficient one. 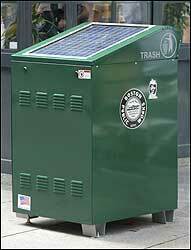 The trash can is solar powered and compacts trash into neat 40 pound trash bricks, according the to Globe article. It requires less pick-ups from city workers and ensures that trash cannot blow out of it on windy days. But its aesthetics are lacking, according to the Commission. It does not match the neighborhood and they want it redesigned in order to match the aura of Back Bay. Unfortunately, they cannot make a trash can into a rich white man, but the Commission will settle for a wrought-iron ornamental casing. Others in the neighborhood have either shown indifference to the trash cans, or have welcome them, but the Commission is unphased. Of course, people who live in glass houses (all up to code with the Commission, of course) should not throw stones. The Back Bay area used to be a mud basin for the previous industrial waste flow known as the Charles River until it was filled in by the city. Here comes the kicker: the Back Bay does not want them, but neighborhoods with lower incomes such as Hyde Park, Jamaica Plain, and South Boston have been asking for them for a few months now. Well, wouldn't it make sense for the city, who paid about $3,600 per compacter, to just take them to the neighborhoods asking for them and out of the neighborhoods that are shunning them? Instead, the City of Boston will come back with a new design for the trash bins in the hope that the Commission will approve. So the city will outright ignore these poorer neighborhoods in hopes that the rich, high tax-base Back Bay area will grant them permission to place trash cans on their sidewalks. Ridiculous. If I lived or had a business in Hyde Park, JP, or Southie I would be furious right now, knowing that the city is pandering to a bunch of rich white guys who do not even want the barrels in their neighborhoods rather than bringing the machines to a part of the city that will actually appreciate them. This just further proves that everything - everything - is political, even something that seems as trivial as trash receptacles. Peace.